I think this is a great idea! Although I "recognize" you and your fluffers from other posts I didn't know the stories behind their coming to find their homes with you or how long you've had them. Can't believe the family that gave away Benji after two days but wanted to pick another??!!? The only thing missing from your post is which fluff is which in your siggy. My DH and I married when I was 39 and he was 44. We had no children. After a couple of years we decided to get a "dog". We started looking a various rescue sites and online. Have to admit I wasn't convinced we'd pass the rigorous testing that many rescue groups require. We didn't have a specific breed in mind just a small but not tiny dog and we didn't want a puppy. We realized that this would be biting off more than we can chew. We found Max on kijiji (like Craig's list but here in Canada). Max's ad had the first photo that appealed to DH. An older woman indicated that her husband had died and she was moving to a smaller home and she couldn't take Max. We did some brief investigating on bichons and went for it really not having a clue what we were getting into. Learned he had not been properly cared for in terms of grooming as he had to be completely shaved down. We had some initial house training problems and later some crating issues but 3 1/2 years later we wouldn't trade him for the world and have learned so much about the breed and met some great people on this site. Thanks Debbra. I just thought that it was ages ago that many of us introduced ourselves it seemed a good idea. I have added to my post to say which is which. I think I've told Darwin's story before, but having the stories all together in one thread is fabulous! We moved sort of suddenly clear across the US, from PA to CA. Our 3 kids were little at the time: 3, 4 and 6. We had been promising our oldest, Mina, a pet long before the move, but told her once we got there and got settled, it would be time for her to finally get a pet. It took more than a year to get settled enough to consider a pet, but she reminded us of the deal non-stop, so we started researching breeds. I wanted it to be small and gentle with kids. My first choice was a cairn terrier, but we couldn't find a breeder with pups due anytime soon. One day we were at a beach near our house and a beautiful, friendly white dog ran up to us. We talked to the owner about what the breed was (bichon, of course) and were they good with kids? More research and it seemed like the perfect breed for us. Again, we had trouble finding a pup, but eventually did. The breeder was some distance away, so we didn't meet him ahead of time, just saw his picture. Apparently, the breeder was concerned that our small children might be rough with him, so she picked out a spunky male. I guess that's a typical trait in dog people- more concerned about the dog than the kids! This is the one thing I would change if I had it to do over. I would never commit to a dog without meeting it first. Live and learn, I guess! He's a part of the family now, just like the kids. Each just is who they are and we love them- warts and all! This is such a great idea for a thread and I've loved reading the stories so far. I had a Westie when we first got married.Connie had many autoimmune health problem,but lived to be 16.It was hard to give her a good quality of life,but with great vet care and a lot of work we managed it. After that I decided no more dogs as I preferred cats anyway and all the illness had been very traumatic. My boys nagged and nagged.I almost decided on a Cairn and joined Cairn forums,but they then wanted 2 rescue cats we found and agreed to those instead of a dog. The nagging soon recommenced and I spent a long time researching breeds.One of the sites I found was " Casa Bianca ".I found years later this was our very own Bianca. I agreed to a Bichon .I hadn't really wanted a dog,but knew I would make sure they had a good life and knowing how much the boys wanted one. I was instantly besotted when I met Abby and we are ultra bonded.She is the best part of my day everyday and I still get excited driving home to know she'll be in the window as I drive up our road.I have more separation anxiety than she does!!! Great Idea- I was raised with miniature dachshunds but when I married and had children, we started with big dogs. We had a German Shepard and after I was divorced, I got an Old English Sheepdog. He was the best dog and he kept me going through those tough years- especially with my teenage daughter. A few years later my daughter wanted to have a dog of her own so we got a golden retriever. So I am sure that you all know how that worked out, she loved the dog on her terms but was too busy to take care of her. My OES lived to almost 14 and the golden was 14 . When the golden got sick and I had to get her to the vet, I realized that when I got another dog, I would have to get a smaller dog because I struggled getting her in my car. I always loved seeing the precious little bichons on the dogs shows and started reading about them. When I decided that this was the breed for me, I found a breeder who actually lived in my town. Luckily she had puppies but only boys were left. I went to meet the 3 boys she had and it was love at first sight. Noah picked me and he has been a love. He is definitely his own dog, can be very aloof, but sweet and loves everybody. He is now 4 years old. He has been a therapy dog for 3 years. The breeder and I became good freinds and I would bring some of her young dogs home for sleep overs. It was good for them and Noah seemed to love the company. Roxie was one of the little ones that she was keeping to show and then breed. Roxie's teeth were not straight and she was really small so after many visits at our home and much pleading, Roxie was allowed to come and live with us. She and Noah are inseperable. Roxie's world is all off balance when she is not with Noah. Roxie became a therapy dog 2 months ago. The puppy bug bite me again and thus Zacchaeus arrived. I really struggled with the decision to get another furbaby as I was concerned about being physically and mentally able to keep up with 3 dogs. It has been an adjustment as Noah and Roxie ignored the puppy. It has been almost 3 weeks and they are all running and playing. Roxie is the boss and rolls Z around. Noah plays when he wants too, but when he is finished, he gets on the couch or his bed. I have had an extra puppy for 4 days as my friend went out of town and the last puppy in the litter had not gone to his home. What fun it was watching the 2 puppies romp and play . Three is definitely my LIMIT. It will be fun taking them out once Z has all his shots. I do take all 3 for walks, but Z is in a jogger so he can see and smell new things, but not be exposed to parvo, etc on the ground. I love this breed and think that they are the best. They are carefree and fun loving and all three adore my grandchildren- which was a must for me. I've ALWAYS loved dogs. We had two sweet family dogs when I was a kid. Snippy and Lucky were both mixed breeds and were our playmates as much as the neighbors' kids. My first adult dog was Toby, a black miniature poodle. He lived to age 18 and I was lost when he was gone. After Toby, I could not face having another poodle, so I switched to shihtzus. I had two at once, Molly and Missy. They were little doll babies, sweet, gentle, and just what I needed. I lost them a year apart, both at age 14. When I knew the time was coming for my little Missy, I began researching breeds to find another that might cause me less allergic reaction. I saw a bichon compete in agility on television and thought, "now there is a cute dog with spirit". There is a woman in my town who raises bichons and so I decided to visit there and see what reaction I might get. I rubbed and played with several of her adult dogs, letting them lick my face, etc. I had no reaction at all. So, I knew I had my breed. I did not, however, like the confirmation of her dogs. They were larger, heavier, and way too long for me. I researched breeders and found two kennels in Connecticut. One of them had a couple of champions and was showing some of her dogs. She also competed with 2 of them in agility, something I wanted to try. Her dogs were small and so cute. I called to make a visit and liked what I saw so I got on her long waiting list and expected to wait at least a year. That didn't happen. I was call only a week later. Mattie had been a puppy sold to a family at age 12 weeks and then only 2 weeks later given to that family's grandmother. The grandmother had no idea how to train a puppy and made a complete mess of it. Mattie was returned to the breeder at 20 weeks old and she was a nervous wreck. The breeder called me because she thought formal training and agility would be just the thing for Mattie. As it turned out, it was a perfect match. Mattie and I had so much fun training together and participating in agility events. I completely forgot that I never took my name off the waiting list. When Mattie was nearly two years old, the breeder called me and asked if I still wanted a puppy. Did I? I wasn't sure. So I thought about it (for a couple of weeks) and then decided to get Sassy. Sassy is Mattie's little sister, same parents, different litter. She was the last puppy left as the breeder was retiring and moving away. So, that's how I got my girls. It's the best two decisions I've made in years! 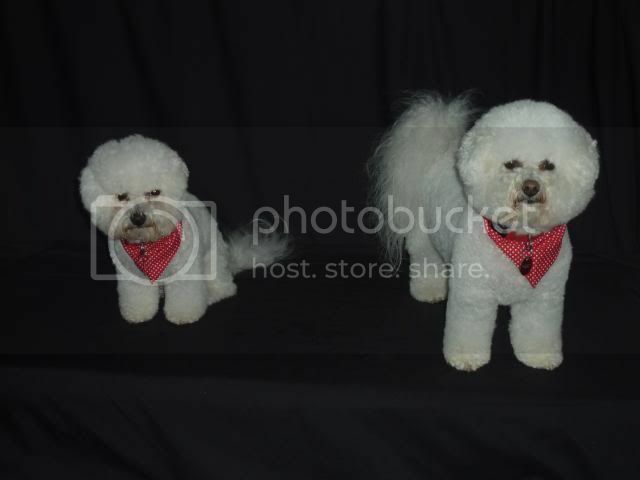 Bichons are Best, Ella & Gabby are white diamonds! I had a cocker spaniel as a child but during all those busy years with young children never considered getting a dog until the time came when they were all grown up. My neighbour next door always had dogs and after losing her two yorkies she got a bichon and the idea came into my head why don't I get one. With Andrea, my daughters encouragement we started to work on my husband who had always been frightened of dogs, finally he gave in! Immediately Andrea started looking on Trade Me and within 2 weeks we travelled to Christchurch to pick up Ella. It was a complete new experience, I had idea what to expect and was very pleased she slept most of the 6 hour trip home but then she woke and my mother instincts kicked in and David's father instincts followed very quickly and she became the apple of his eye. It really helped that the two of them share the same birthday! When Ella was 18 months old I started to hanker for another fluffball and once again David was not keen as he thought one was enough, however we saw an ad in the paper selling bichon puppies, one girl and a boy and the people lived in Wanaka just along from our bach. I was dead set on getting another girl so we took Gabby in case David changed his mind and she was the complete opposite to Ella, very small, timid, not at all out going. So now we have our two little girls, one little, the other not so little and as different as night and day but they have bought so much joy into our lives and we do so many things with them that if we didn't have them we probably wouldn't do. Getting a bichon or bichons has been one of the best things I have ever done and my heart would gladly welcome another one but my pocket and my husband wouldn't! Wonderful stories, for sharing. As Pam said, keep them coming. What a neat thread! I love hearing everyone's stories especially since I'm fairly new here. After my Son left home (17 yrs ago) I had a terrible case of 'empty nester syndrome'! I started researching small dogs that were non or low shedding as I'm kinda of a neat freak and didn't want a hairy house. All the dogs I was drawn to were white with dark eyes and noses. I ended up with a Westie and he became my constant companion. I never knew a human could feel so much love for an animal until I got him. When he was neutered at 5 months, he had a terrible pancreas attack which damaged his pancreas causing other attacks and eventually Diabetes. I had him PTS at age 8 when the pancreas finally gave out. 2 weeks later I saw the ad for a Westie mix at a local shelter and went to check him out - no Westie in that mix! 2 doors down was 'Romero' who was jumping up and down like he was on a pogo stick. They had him listed as a Schnauzer/poodle mix and with him being shaved down it was hard to tell what he was. When he wasn't jumping up and down he was circling in his cage non stop. He was on a rabies hold and the sign on his cage said he was not good with kids, other dogs, cats and that he was a biter. The Kennel worker said after the hold time was up he was to be put down. He had this wild look in his eyes but also something else that I couldn't put my finger on. I got permission to walk him so took him outside and he did his blitzing at the end of a 12' leash and then sat down and looked at me like 'what would you like to do now???' I had him heeling and sitting on command in 5 mins. I worked with him a little longer then put him on a table and combed him all over and pressed gently on his paws to check his reaction and even checked his teeth and even put my fingers into his mouth. He just needed out of that cage, to expend his energy and calm down. I came back to work with him a couple more times and after showing the Shelter Manager what he was capable of, she allowed me to adopt him. The stipulation was I had to warn anyone that came in contact with him (groomer, kennel workers and Vet) that he was a vicious dog and if he could not be controlled or trained not to bite I was to bring him back. Bullett is a work in progress and only after I had him almost 4 yrs did he bite the groomer. But then she was the one that burned his scrotum (blistered it) and neck with the clippers, jabbed the clipper blade corner into his side cutting him and who knows what else so in his mind (and mine!) she deserved it! She was removing his collar and as it snapped open he whipped around and snapped at her hand. It didn't break the skin but one tooth indentation was there. I do wonder if she pinched him or pulled his hair when removing the collar. Now he is doing the 'playful looking foot biting thing' so not sure if it's playful or not. I never thought I'd love another dog like I did my Westie but do. I figured Bullett would be gone by the time I retire and I'd get a Westie pup to raise and go with me traveling the country. Now I'm considering a Bichon puppy. There is not so much of the dominant/Alpha stuff going on with the Bichon and the breed has fewer health issues. I think I'm hooked!